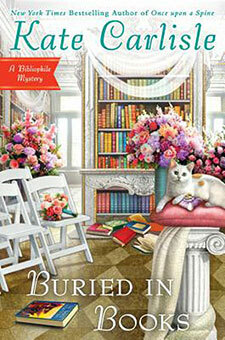 Matrimony and murder collide as San Francisco book-restoration expert Brooklyn Wainwright walks down the aisle. . .
Brooklyn's prewedding calm is shattered when one of her formerly feuding friends is found murdered and Brooklyn determines that one of the rare books is a forgery. She can't help but wonder if the victim played a part in this fraud, or if she was targeted because she discovered the scam. With a killer and con artist on the loose, Brooklyn and Derek—with the unsolicited help of their meddling mothers—must catch the culprit before their big day turns into a big mess. "Charming. . . [Brooklyn's] well-planned wedding weekend happens to coincide with the big National Librarians Association conference. . . Might murder also spoil Brooklyn's wedding? Book lovers are in for a treat." "The run-up to San Francisco bookbinder Brooklyn Wainwright’s wedding to security expert Derek Stone immerses her in a librarians’ conference before the ceremony itself unfolds as a race between the minister and the meat wagon." "Carlisle does a great job of evoking life in San Francisco through a delightful cast of quirky characters. Her usual blend of humor and mystery will draw in both new and longtime readers. Recommended for admirers of Jenn McKinlay, Lorna Barrett, and Joan Hess."